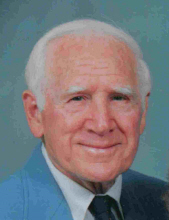 J. Stanley Smith, 87, of Harrisonburg went to be with his Lord and Savior, on Thursday, February 7, 2019. He was born July 15, 1931 in the Stoney Run Community of Sugar Grove, WV, a son of the late William Gordon and Lula (Puffenbarger) Smith. Mr. Smith was a carpenter by trade, building houses with his brothers for many years. He was an avid gardener, outdoorsman and keeper of the “old-fashioned ways” of providing for his beloved family. He found delight in hard work and faithful church attendance. Stanley served in the United States Army from 1952 to 1954. He was a life member of VFW Post #9666 in Sugar Grove and the American Legion Post 27 in Dayton. On October 6, 1956, he married Jean Ellen (Sandy) Smith, who preceded him in death on December 28, 2010. He is survived by a son, Jeffrey Smith (Sally) of Dayton, two daughters, Shawn Belcastro (Marc) of Glen Allen and Karen Whetzel (Mark) of Harrisonburg; six grandchildren, Lydia Smith, Codi Jo Wheelbarger (Hunter), Christopher Belcastro (Dabney), Elizabeth Kelly (DJ), Sydney Whetzel and Claire Whetzel; one great-grandchild, Emerson Belcastro; two sisters, Cleo Simmons of Staunton and Wanda Pitsenbarger of Franklin, WV. In addition to his wife and parents he is predeceased by his two brothers, Cletus and Gilmer Smith; and seven sisters, Glenna Puffenbarger, Sheba Rexrode, Jane Downs, Vada Wilfong, Charlotte Eckard, Willadene Simmons, and Wilda McDorman. A memorial service will be conducted at 11:00 a.m. on Monday, February 11, 2019 at Bridgewater United Methodist Church with the Revs. Stephen Creech and James Harris officiating. The family will greet friends following the service. Burial will be private at a later date. In lieu of flowers, memorial contributions may be made to the Sugar Grove VFW Post 9666, Attn. : George Armstrong, 7128 Sweedlin Valley Road, Brandywine, WV, 26802. To send flowers or a remembrance gift to the family of J. Stanley Smith, please visit our Tribute Store. Rev. Stephen Creech and Rev. James Harris officiating. The family will receive friends following the service. Burial will be private. "Email Address" would like to share the life celebration of J. Stanley Smith. Click on the "link" to go to share a favorite memory or leave a condolence message for the family.